The Kuhl Interceptr™ vest features Alfpaca Gold™ fleece for performance, durability and warmth. An upgrade from the original, Alfpaca Gold uses a ring-spun process for greater softness and durability than open-ended yarn. Knit with multi-toned yarn, Alfpaca Gold exhibits a richness and depth not seen in other fleece. 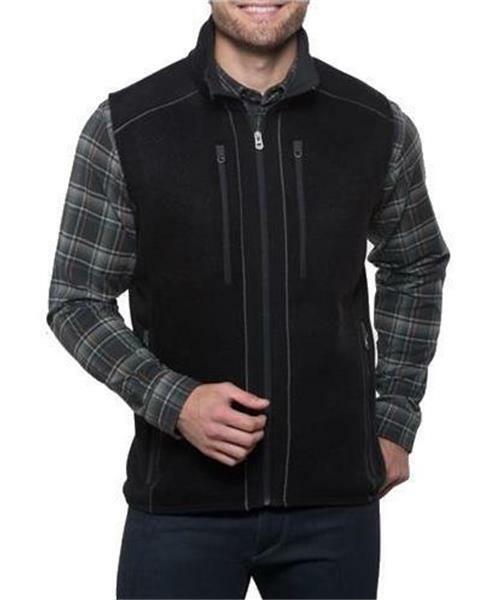 Kashmira™ side panels increase breathability, while a micro fleece interior collar adds warmth and comfort. Sewn with Dynamik™ stitching for more stretch and strength than traditional flatlock, low bulk seams make layering comfortable and easy. Hand warming pockets and chest pockets with zip closures provide secure storage. With superior wicking and quick dry properties, the Interceptr fleece vest delivers technical performance when you need it most.